The U.S. Department of Energy estimates it will cost about $292 million to demolish K-27, a highly deteriorated uranium-enrichment plant that hasn’t operated since 1964. That’s about five times what it cost to demolish the nearby K-31 building — even though K-31 was twice as large as the 383,000-square-foot K-27. There are reasons, of course, for the cost difference. Unlike K-31, which was essentially an empty shell of a building when workers began demolishing it last fall, K-27 still houses its original processing equipment. And it’s loaded with hazardous materials, including deposits of fissionable uranium and toxic chemicals of all sorts. According to Ben Williams, a spokesman for DOE’s Office of Environmental Management, only a third of the projected K-27 cost will be spent on actual demolition. The rest of the federal funding is to prepare the uranium facility so that it can be taken down safely and securely and without spreading the contaminants. URS-CH2M Oak Ridge (UCOR), the Department of Energy’s cleanup contractor in Oak Ridge, is managing the K-27 project, and as many as 500 workers are involved. “One of the principal things we do is called hazard abatement,” said Ken Rueter, the president of UCOR. That includes removal of asbestos and other materials of concern. Perhaps the biggest task is eliminating the radiological and nuclear hazards to make the building “criticality incredible.” That designation means there’s no longer the possibility of an uncontrolled nuclear chain reaction and release of high radiation fields, which is a concern when dealing with significant amounts of fissionable uranium. Security clearances are required for workers because the gaseous diffusion technology — once used to process the uranium and concentrate the fissionable U-235 for use in nuclear weapons and power reactors — is still classified. Once demolition starts, it will take about 9 to 11 months to do the job, according to contractor estimates. The goal is to complete the demolition by the end of 2016. UCOR is injecting foam into some of the process equipment to prevent the spread of contaminants during demolition, but the DOE contractor also is removing equipment of most concern before demolition starts. Rueter said the uranium-laden equipment is taken out and sent to what’s called a segmentation shop on site, where it’s “mined” to remove the highly enriched components. “That gets properly packaged and gets sent out West,” he said. In some cases, the old equipment also is sent to the Nevada National Security Site, but some of it is acceptable for disposal at DOE’s Oak Ridge landfill known officially as the Environmental Management Waste Management Facility. Rueter would not comment on how much enriched uranium has been taken out of K-27 in preparation for demolition. Nor would he discussed the enrichment level — the percentage of U-235 — of the uranium. K-27 will be the last of the five major uranium-enrichment plants at the Oak Ridge site that’s being cleaned up and gradually converted to a commercial industrial park. Rueter said UCOR is adapting lessons learned from the previous demolitions to the K-27 project, including ways to limit the spread of technetium-99 — a radioactive contaminant of particular concern. During the last phase of demolishing the K-25 building — by far, the largest of the uranium processing plants — measurable amounts of Tc-99 were washed away from the site during rainstorms and ultimately infiltrated sewer lines and contaminated the city’s wastewater treatment plant. 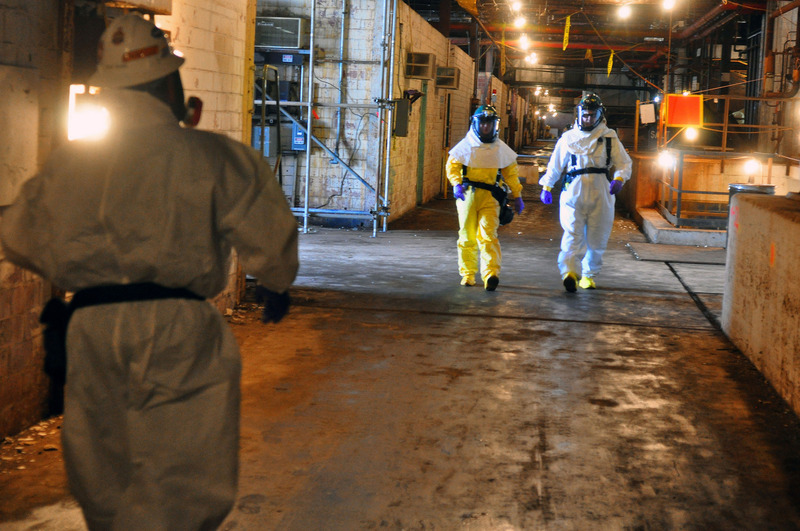 “One of the lessons learned from K-25 was to mitigate as much of the technetium risk as possible, take all of the technetium-laden equipment out of the building (prior to demolition),” the UCOR official said. This entry was posted in Cleanup, nuclear, Oak Ridge EM, UCOR on July 6, 2015 by Frank Munger.